South Korea and Argentina have agreed to exchange visits by their young citizens as part of a work and pay program, Seoul's foreign ministry said Monday. The two sides signed the "working holiday" agreement last week, which allows South Koreans, aged 18-30, to work, study and travel in Argentina for up to a year. The yearly quote is 200. Argentine youth will be able to do so in South Korea as well. 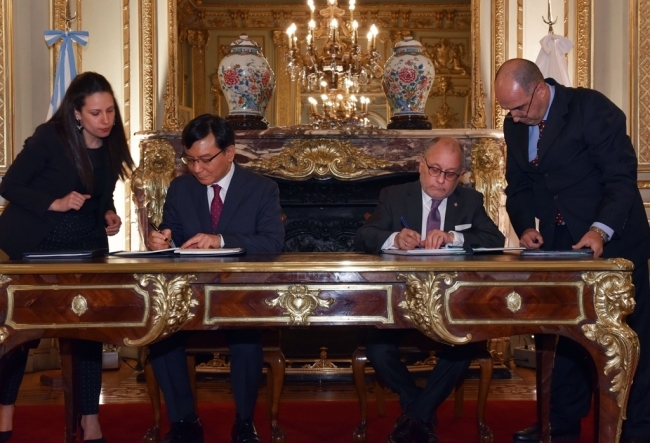 The accord was signed by Argentine Foreign Minister Jorge Faurie and Seoul's Ambassador to Buenos Aires, Lim Ki-mo, on Tuesday (local time). It's to take effect 60 days after the signing. South Korea has working holiday agreements with a total of 23 countries. As of 2017, around 40,000 South Koreans had benefited from the program. The minister and the ambassador also inked a bilateral social security agreement, which requires parliamentary approval. Under the pact, South Korean workers dispatched to Argentina, or those who have businesses there, will be exempted from local social insurance premium for up to five years. The same rule will be applied to Argentine workers or business owners in South Korea.